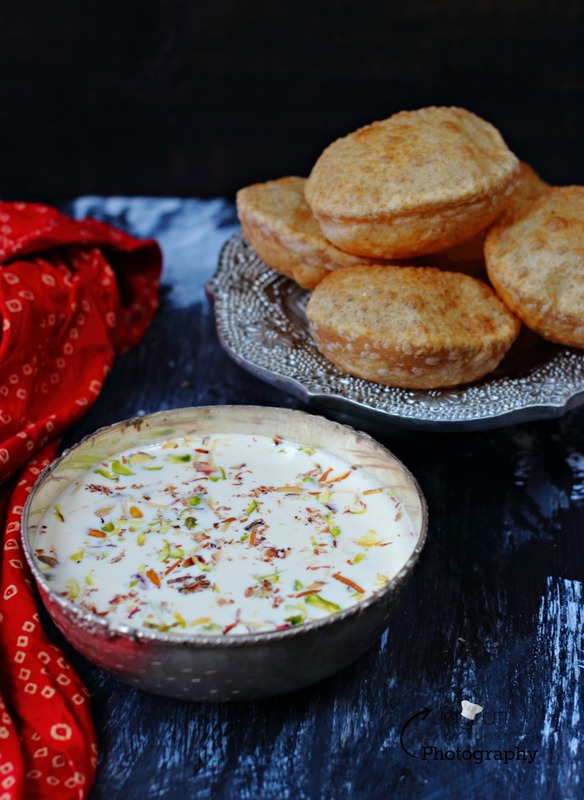 You can devour and enjoy Poori with bhaji, sabji, tea, yogurt pickle, halwa , Siro kheer , Shrikhand, Keri no ras, Basundi or Doodh paak, or sometime on it's own, there are endless way to enjoy Poori !! After Roti or Chappatti I think Poori is most well known and versatile Indian bread you can find in Indian Cuisine. 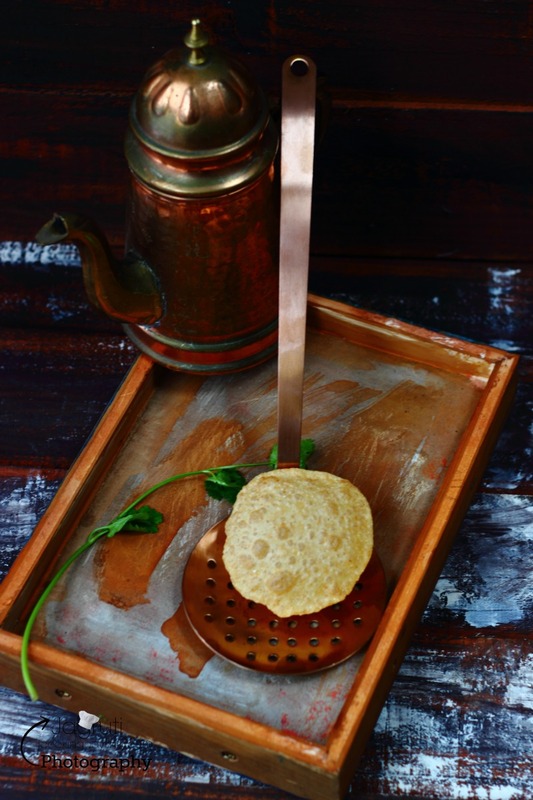 Poori or Puri is an unleavened deep fried Indian bread. 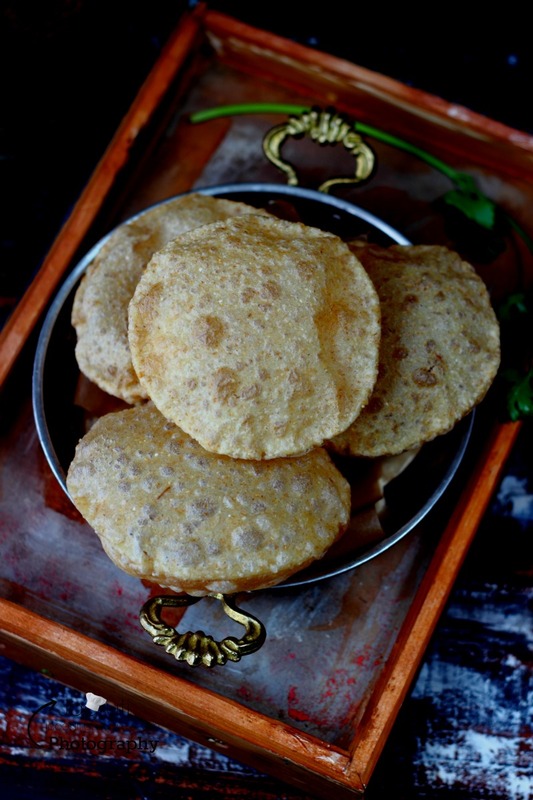 When I was a kid, at one time, in our house Poori used to be counted as a luxurious, novelty and treat, so they were left for mainly big festivals and some special occasions or when guest arrives. Nowadays, I don't fry too often because health doesn't allow it ! 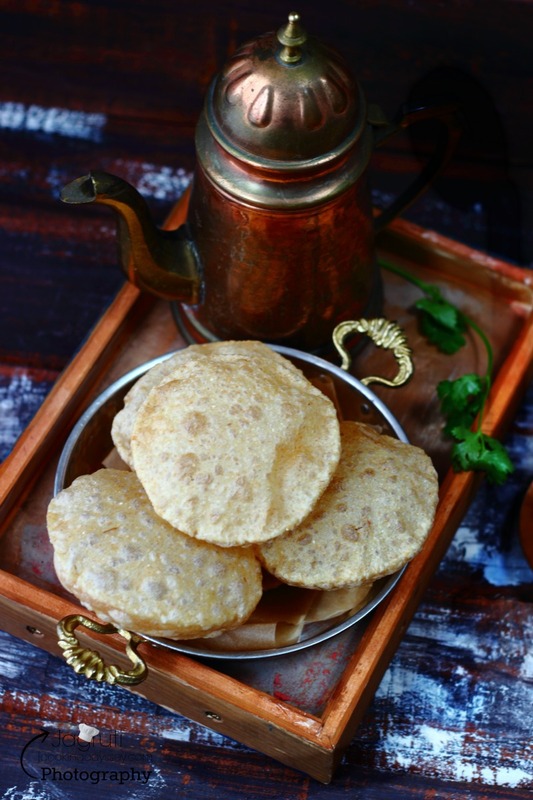 We Gujarati's make two type of Poori, Saadi (Plain Basic) poori, and Masala Poori and both variations make delicious combo with sweet and savoury dishes. The moment you see round and fluffy poori coming out of frying pan your worries goes away, obviously the flop ones can be quite overwhelming. I've been through these stages many times, but now experience speaks a lot ! Now that I talked about experience, let me share with you my experience about Poori. Anyone can make Poori, there are not many hard and fast rules, just keep couple of things in mind. 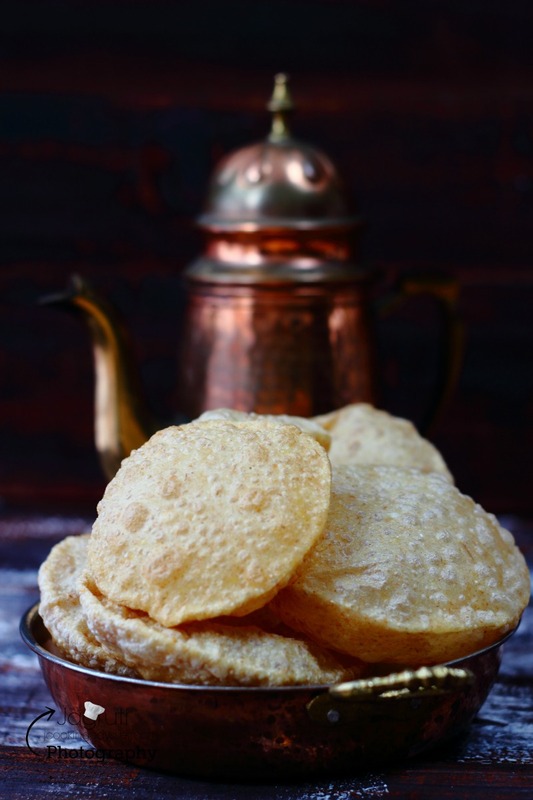 If you want to make perfect poori, start at very early age, watch your elders how they are making it, help them making it, best to start with rolling few pooris first, surely one day you will be expert in making Poori. Never use a thin bottom pan for frying, reason is that oil heats very quickly in those pan and sometimes there is a chance of pan catching on fire. Always use wide and heavy bottom kadai for frying. and keep patience and keep the practise going, you will get there ! In a wide plate ( Parat or Kathrot ) place flour. Add salt , oil and ajwain and mix everything with your fingertips. Now add water little by little and mix the dough. Once dough coming together, stop adding water. Now start kneading the dough, knead dough well for about 8-10 minutes. Dough should be semi stiff, not soft like chapatti otherwise you will need dry flour to roll the poori and the Poori will start to soak up lot of oil. Also not very stiff either or you will have Pooris with cracks. Cover the dough for 5 minutes with clean kitchen towel. Make small equal sized ball. Start heating oil in a kadai. Take one ball and roll gently with rolling pin and make round poori. Do not stack rolled pooris or they will stick to each other. Once oil is heated, add tiny bit of dough and see if dough comes up straight away on the surface means oil is heated and ready to fry the pooris. Carefully slip rolled poori into hot oil. Very gently press with a perforated spatula ( jaro ) and Puri should be puff up. Once puffed up turn poori over and cook other side until light golden. Remove poori from the kadai. 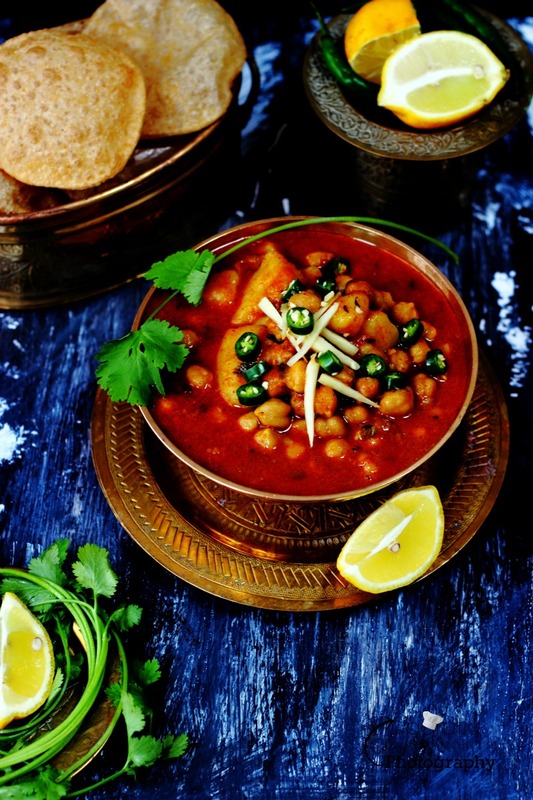 Serve hot with sweet and savoury dishes.